When heading into battle or simply traveling through a dangerous place, you need to be well-equipped for any eventuality. The Pistol Baldric allows you to easily carry additional weapons in its slots, pockets, and holster. Made from 9-10 oz. leather, this black baldric suits any style of weaponry with its classic appearance. Available in one size, this belt is adjustable so you can be sure to find a great fit. The over-the-shoulder style allows for greater weight support without restricting the moment of your arms. 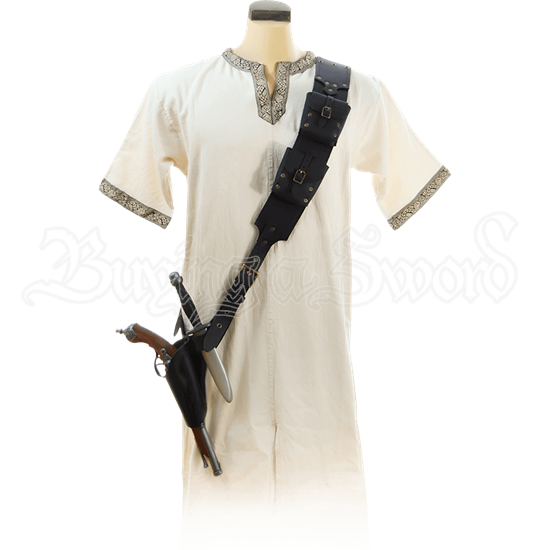 The baldric is pictured for a right-handed person, but it is also available for someone who is left-handed. The Pistol Baldric combines functionality and comfort in this stylish piece. The leather was amazingly high quality , the workmanship was totally pro ! This will last forever !